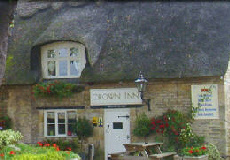 Places to stay: The Crown Inn (information at TripAdvisor) is a beautiful old thatched property within the village itself. Places to stay: Surprisingly, there is nowhere for the history-enthusiast to stay in Hemingford Abbots itself, but The Old Ferryboat at nearby St. Ives is one of the oldest inns in England. Alternatively, Houghton and Wyton (below) are only half a mile away and offer alternatives. 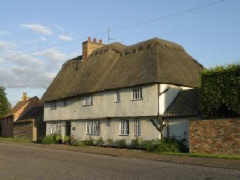 Places to stay: Cheriton House is a highly-rated Victorian bed and breakfast in Houghton, while Magdelene House in Wyton is a stunning thatched house dating from the 17th century whose accommodation is within a converted barn. Places to stay: Although there are no period hotels or inns within Millbrook itself, anyone who takes pleasure in staying in historic places will no doubt be interested in nearby Menzies Flitwick Manor – a Georgian country house which offers four-star rated accommodation. Places to stay: We are unaware of anywhere presently offering accommodation within Turvey itself, while Linden’s Guest House is a fine Victorian property in nearby Olney. More details are available at TripAdvisor. Places to stay: Those interested in Tudor buildings might find Church Hill House B&B in nearby Wethersfield to their liking, while the Olde Bull in Sudbury (see TripAdvisor) is a Grade-I listed coaching inn dating back to the 16th century. Places to stay: The Three Tuns in Finchingfield offers bed & breakfast accommodation within the village itself, while a short drive away is the small town of Thaxted in which one will find The Swan – a traditional coaching inn. Places to stay: Alas, despite being so historic there are few places of heritage to stay in the immediate vicinity excluding Channels Lodge – a 15th century former farmhouse on the northern outskirts of Chelmsford. Places to stay: The Greyhound is a pretty old inn offering bed & breakfast within the village itself, while the mock-Tudor country house Pendley Manor is little over a mile away. Places to stay: The Brocket Arms offers accommodation in 14th century surroundings - further information is available via TripAdvisor.